Firstly, you receive a pair of exclusive lulu lemon sea wheeze training shorts in the mail prior to training starting in May, each year the shorts are different and it gets the excitement leading into the training going. The shorts were mailed out in this cool bag that said “ For Free-Thinkers & Curiosity-Drinkers” just so happens that the exclusive beer for the event made and provided by Stanley Park Brewing Company was called “Curiosity”. Also with the shorts is the story of SW15 called “The Sea Wheezical story of Solutions SW15” the story tells the journey of the Rabbit: The Essence of Run, the Peacock: The Spirit of Yoga and lastly the Raccoon: Power in the Party. The story is very well laid out and it all makes sense now that the race is over. This is just the start of the uniqueness of the Sea Wheeze race experience. Fast forward to the runners showcase which is a lulu addicts shopping heaven, just imagine walking into a huge ballroom that has number balloons floating in the air which represent your size, 2, 4, 6, 8, 10… and under each of these balloons you will find the exclusive to the Sea Wheeze collection of shorts, cool racer back in very different designs to what is sold in any lulu store. You will also find headbands, bags and socks and runners tights. The only downside to the showcase is that you need to line up super early to get in, it seems there is such a crazy demand and obsession with lulu clothing that some people will line up around midnight and sleep outside just to be the first into the building when it opens. This year lulu lemon set up a special time slot just for the registered runners of the event from 7 am to 9:30 am Exclusive Runners Shop and then from 10am to 8 pm it was Sea Wheeze Showcase store open to the public and all the runners that didn’t line up super early to get into the store to shop and buy exclusive Sea Wheeze running gear!! 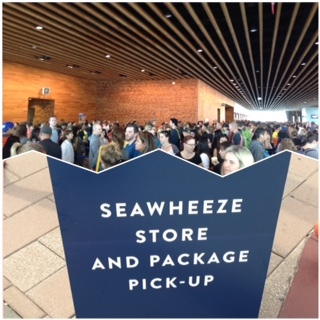 My son and I arrived at the Vancouver Convention Centre at 8:50am and I think we got into the store just before 11am, the end of the line was around the backside of the building. It seemed that everyone was in front of us as the line moved forward the line behind us really didn’t get much longer with people waiting to get into the store. Even when we were inside the building waiting, looking outside there was no line-up and this was around 11am. But that doesn’t guarantee that you will be able to get any of the exclusive and very limited clothing that was being sold. Once inside you were greeted by loud music playing to enhance the energy and the frenzy into the excitement of the experience. It really does build up as you are waiting outside for hours to get that first look and hoping that you can at least get one tank top in your size. I was able to get 3 in my size and I am pretty happy with my purchase. 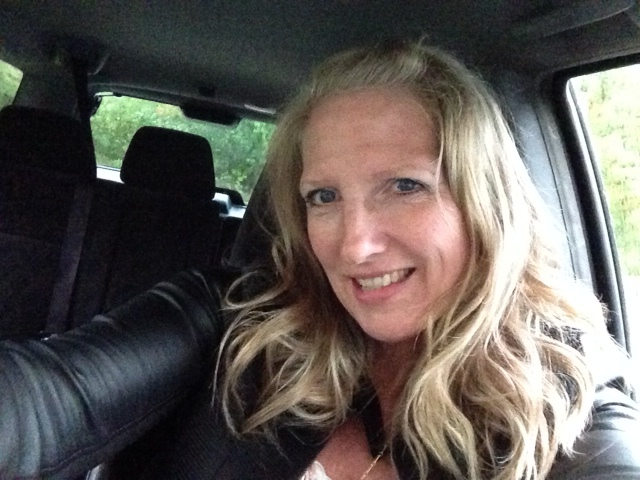 I did find a lulu jacket in the bin of clothing that had to go back on the tables in a size 6, I tried it on and it was a tad tight but as I am losing a few pounds I am hoping that once I reach my goal weight it will fit, if not I have a size 6 that will be up for sale next year. The line-up for package pickup I heard was anywhere between 45 minutes to over an hour, it really depended on when you got in line. After the showcase I took my son out for lunch and then we came back and pretty much walked right up to package pickup, I am guessing that we were only waiting for 5 minutes. 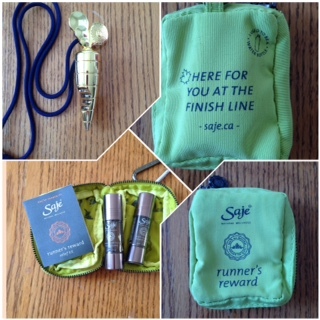 Package pickup was pretty simple, in your package it included a gear check bag, a race chip (which has a picture of the founder of Lulu lemon’s face on it, as his name is Chip Wilson). Also you get your wrist band that gets you into the special events, and a water bottle. Runners can take part in the noon hour yoga at the Jack Pool area just outside of the convention centre. I didn’t take part as I had other plans with my son on Friday afternoon. It did look like a lot of fun for those who did take part in the yoga at noon. Another yoga session was offered from 7:30-8:30 on the Friday evening, seeing I didn’t get out of my house till after 6pm and I still needed to check into my hotel, so I didn’t get the chance to take part in the yoga. As normal with any race, the line-up for the bathrooms is always crazy long and this was the case also at the convention centre. I found that if you just went outside towards the start line you could find the port a bathrooms with a very small line ups. The corrals were nicely marked so you could see by the signage provided exactly what starting corral you wanted to be in and with the pace beavers holding up signs with the different times it made it very easy to get into your corral. I tried to jump in with the 2:10 pace beavers but seeing I was a tad late getting into the corral it was a little hard making my way up to the pacer, if you want to run with the pacer’s you really need to get into the corrals with plenty of time, at least 15-20 minutes so you can relax and be settled. I got into the corral after the race had started and I felt a little rushed and not fully prepared mentally for the race/run that was about to start. Which could either be a good thing or a bad thing depending on what time does to ones thoughts. I will have to say that I didn’t have time for the nervous nerves to kick in and I was pretty relaxed and ready to go once I came up to the starting mat. The actual course was beautiful from the beginning to the end, the race starts and finishes on Cordova Street in Vancouver. It quickly leads you out of the downtown core towards BC Place then down Main Street briefly before heading back along the path that overlooks False Creek then up and over the Burrard Street Bridge around 8km where you can see the Lulu building. You continue running along Cornwall Ave and then you turn back midway between Larch Street and Balsam Street and go back towards and over the Burrard Street Bridge where you will hit the 11km marker the next part of the course takes you quickly down along the seawall around English Bay, another very scenic section with the North Shore Mountains the beach and the water. Once you hit the actual Stanley park seawall you will cross a timing mat prior to 15km which generates a message from friends for you coming up on a big screen TV cheering you on, it was actually pretty darn cool seeing the excitement of the runners around me getting messages of support from friends at this point in the race. The seawall was beautiful and as the space is very limited for cheer squads as the seawall is very small for running surfaces, that doesn’t stop the event from providing cheer support. You can look out on the water and see a group of people cheering from paddle boards, and just under the Lions Gate bridge was a barge with a band playing awesome music to help you push the final few km’s, and I can’t forget the mermaids lounging on the rocks cheering the runners as they pass by. I also forget to mention when we were running across the viaduct in the beginning there was a really big cheer squad from a cycling company all on spin cycles riding and cheering to loud music it was pretty darn cool seeing them all lined up on their bikes working out and cheering for the runners. I will have to say that the water stations were very well stocked with water in the event of a race with warmer running temperatures, we were very lucky that the race day started out on the cooler side with the day starting out with rain prior to the start of the race. I would like to thank all the volunteer’s that helped setting up for the race that Friday evening into Saturday morning with the rain, your help is very much appreciated for us runners, a very “BIG CHEER” to all of the volunteers that helped make this event so special first timers and everyone else. 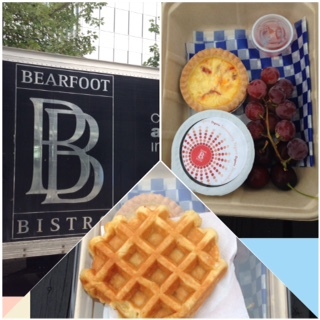 A waffle with organic strawberry jam, plus strawberry Greek yoghurt, grapes, cherries, and a mini quiche and believe me it was really yummy. 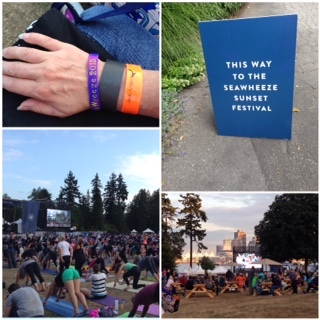 Over and beyond what a race gives you, yoga at the Brockton Oval – Stanley Park 6pm – 7pm then followed by a live concert from 7pm-11pm with St Lucia, Yeasayer and Bear Mountain. The concert was fun as Ariana and I just walked around and chatted and listen to the music up on the hill and enjoyed a few of the limited edition Sea Wheeze Curiosity Beers during the evening. 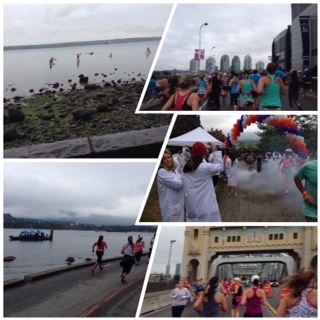 And that pretty much concludes my race report recap of the Sea Wheeze 15 half marathon in Vancouver BC. I would highly recommend this race as it truly has lots to offer for the price of $128 Canadian. I would say the only downside to this race is how much the hotels in the general area increase their prices over the race weekend over the past few years, but I guess that is the way of business now a days and everyone is out to make a profit, don’t even get me started about making a profit. It seems over the years people go the to the showcase and purchase lots of exclusive sea wheeze running clothes only to go on eBay and sell the clothing for twice what they paid for. It truly is crazy and I personally can’t wrap my head around that part, but it is what it is and people will continue to do this with pretty much any product that is high in the demand.